Directorate of Welfare of Scheduled Castes, Assam Announced Scholarship to the S.C. Meritorious Students. - Jobs4NE : Jobs in Assam and North East India. 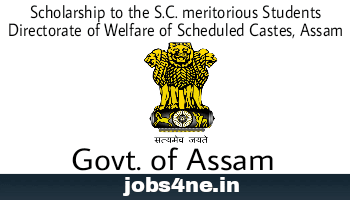 Directorate of Welfare of Scheduled Castes, Assam Announced Scholarship to the S.C. Meritorious Students. The Directorate of Welfare of Scheduled Castes, Assam hereby invites/ applications from the Scheduled Castes Meritorious Boys/ Girls students who have passed in HSLC/ HSSLC Examination under the Assam Higher Secondary Educational Council (AHSEC) and Board of Secondary Education of Assam (SEBA) securing 80% and above marks during the academic year 2017-18 for awarding of one time grant @ Rs. 10,000/- (Rupees Ten thousand) only under the scheme “Financial incentive to S.C. meritorious Boys/ Girls students for the year 2017-18 subject to sanction/released of fund by Govt. Last Date for receiving of Application Form: 15-07-2017. The Selection will be made on merit basis only. The qualified candidates may submit their applications as per prescribed format given in attached file to the office of the Directorate of Welfare of Scheduled Castes, Assam, Sarumotoria Dispur Guwahati-6 on or before 15.07.2017.